All great sandwich makers hold a certain truth to be self-evident: success depends on ingredients and construction. Each layer of the sandwich must be fresh and placed in accordance with how it complements the next closest ingredient. Perfection in simplicity and creativity are equally hard to achieve but supremely valued when accomplished. 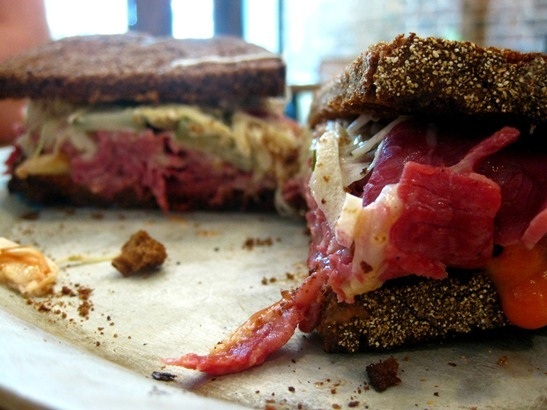 Court Street Grocers is barely a year old, but their sandwiches reflect years of wisdom. The Delight ($10) achieves perfection by contrasting texture and flavor; toasted Orwasher’s pumpernickel, tender house corned short rib and melted muenster cheese provide a solid foundation for a sweet and tart salad of Gus’ full sour pickle chips and house made coleslaw and thousand island dressing. The thoughtful preparation is mirrored in CSG’s sourcing of local baked goods and regional food products (check out this impressive page), making it a general store that’s anything but general. food guy, this sandwich sounds good from your description, but this picture is terrible. your photos have gone downhill since you’ve returned to action — what gives? Thanks for your honest and positive assessment as always. You have such a way with words. We’re loving how delicious this sandwich looks! We’d gladly devour The Delight, no matter how it photographs! Thanks for giving an honest depiction, Lawrence!